The Dresden Plate is a popular, easily recognizable quilt pattern known for its flower-like pops of color on a usually neutral background. It's a versatile pattern than can use scraps of many colors or a more controlled theme of colors and patterns, and it works well as both a bed quilt and a wall hanging. The blocks for the Dresden Plate use a combination of piecework and appliqué and come together quickly. Wash all your fabrics on a warm setting in your washer and dry on a high setting in your clothes dryer. Remove any excess threads with scissors. Iron all your fabrics to remove any wrinkles. Download a pattern for your Dresden Plate pieces. Each block contains a flower-like shape consisting of 20 teardrop-shaped pieces, a center circle, and a 17 x 17-inch block piece. Print and cut out the teardrop-shaped pattern piece. Cut out 20 teardrop-shaped pieces for each block. You can be very creative here, using all one color for all your pieces, alternating colors so that the pieces contrast with each other, or using a variety of colors and patterns for each piece. Lay out your teardrop-shaped pieces on a hard, flat surface and organize them the way you want them to appear on your quilt block. Pin together two pieces that are side-by-side on their long edges with the right sides together. 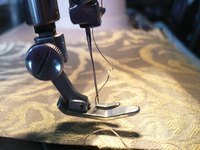 Sew with a straight seam and a ¼-inch seam allowance, stopping your seam ¼-inch away from the curved edge. Press open your sewn seam so it lies flat. Continue sewing your pieces together in this manner until all 20 pieces are sewn together and they look like a flower. Cut out the center circle for your Dresden Plate quilt. Fold the circle in half on both the length and width, pressing in the creases with your fingers. Cut out a 17-inch by 17-inch square for your block piece. Fold this square in half on both the length and the width, pressing in the creases with your fingers. Unfold both the circle and the square pieces. Lay your square on a hard, flat surface. Place the circle in the middle of the square piece, lining up the lines on the circle with the lines on the square. This will ensure that the circle is placed in the direct center of your block. Place your flower piece made of the teardrop pieces on the square so it lies over the circle. Line up the vertical and horizontal center seams of the flower piece with the lines on the circle and the square pieces. Machine appliqué around the outer and inner edges of the flower piece with a small zigzag stitch to secure all the pieces into place. Trim the block to 16½ inches square when you are done appliquéing. Make as many blocks as you need for the size quilt or wall hanging that you want. For a twin size quilt, you will need 35 blocks, arranged 5 blocks across and 7 down. For a full/queen size quilt, you will need 42 blocks, arranged 6 blocks across and 7 down. For a king size quilt, you will need 49 blocks, arranged 7 blocks across and 7 down.